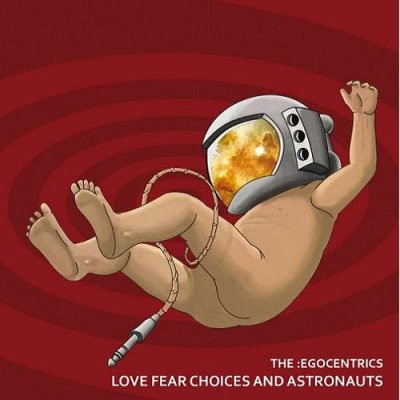 Love Fear Choices And Astronauts is an instumental masterpiece created by a trio from Romainia that call themselves The :Egocentrics. :Ego consists of Brenn (guitars), Jess (bass), and Hera (drums). As stated on the band's website, "Having developed a solid band chemistry thoughout the years The :Egocentrics deliever a fresh take on psychedelic rock with a jazz-like state of mind..." I honestly could not put this band and this album into better words. I truly love attempting reviews of instumental masterpieces, such as this. These musicians really challenge a listener, to put their beautiful soundscapes and echo-driven ambient passages into words. I hope to do not fail you :Ego. Love Fear Choices And Astronauts (yes, this is the last time I will completely write this album title out) consists of four tracks: Spacewulf, 20 12, Bright Dawn Of The Soul, and Mystic Initiation. Do not let the short listing fool you. These tracks are ten plus minute songs, that pack such maverlous transitions, which can dupe the listener. The album introduces itself and departs much quicker than it seems. Many instrumental albums can become dull and snooze-worthy, :Ego keeps the tunes fresh and the mind reeling. They combine beautiful ambient undertones and epic and vast soundscapes, all while keeping great jazz/bluesy licks throughout (my favorite is on 20 12 around the 6:00 minute mark). Mystic Initiation begins with a very relaxed and mellow harmony. This allows us (the listeners) to melt into the cosmic highway and prepare us for the up, downs, highs, and lows of the course. This is the Mystic Initiation. LFC&A is another fantastic piece of music that will not get nearly the play it deserves. I will certainly be sharing the Love and introducing :Ego to as many folks as I think will dig it. There really is no stand out track to me. I am once again stuck to say, you must listen to the entire album and make the choice yourself. The :Egocentrics have created something authentic with LFC&A. Excuse me for now, I have to go pick up their newest: Center of the Cyclone.